Tinplate Company is currently trading at Rs. 166.80, up by 0.75 points or 0.45% from its previous closing of Rs. 166.05 on the BSE.The scrip opened at Rs. 167.60 and has touched a high and low of Rs. 168.70 and Rs. 163.50 respectively. So far 23717 shares were traded on the counter. The BSE group 'B' stock of face value Rs. 10 has touched a 52 week high of Rs. 324.80 on 12-Jan-2018 and a 52 week low of Rs. 108.50 on 04-Jul-2017.Last one week high and low of the scrip stood at Rs. 169.40 and Rs. 153.30 respectively. The current market cap of the company is Rs. 1747.95 crore. The promoters holding in the company stood at 74.96%, while Institutions and Non-Institutions held 2.51% and 22.54% respectively.Tinplate Company of India is planning to expand its capacity, amid improving domestic demand for packaging. The proposed plan will take 6-12 months to arrive at a conclusion. 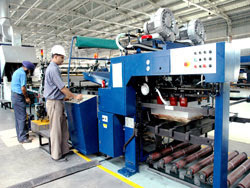 Tinplate Company of India is the largest indigenous producer of tin coated and tin free steel sheets in India.